The set also features a set of special treats. Just like the super rare Expedition lands from Zendikar, that created special foil versions of some of the most popular lands from the history of magic, Kaladesh introduces the Masterpiece: Inventions. A set of some of the coolest artifacts from all time, from Crucible of Worlds to an amazing version of the Commander staple, Sol Ring. If you want to take a look at all the cards in the set, click here, or if you want to do a simulated opening of bunches of packs or do test sealed or drafts to get familiar with the set, click here. 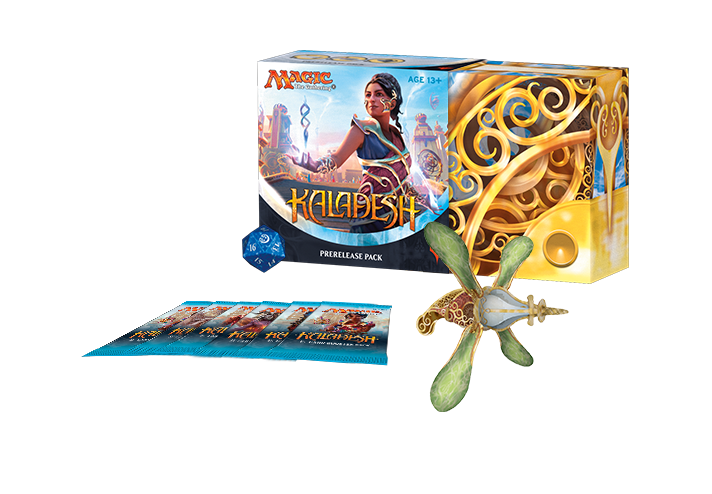 Kaladesh prerelease Sept 25-26. Boxes on preorder for 99.99 till sept 15, $109.99 till 9/21. $119.99 after that. The set releases Friday, Sept. 30th, and we will be open at midnight on the Thursday before to give folks their boxes if they want. The cards in this set reflect the Inventor’s fair that is taking place, with a special focus on artifacts and those that create them. There are extra abilities, such as vehicles, that are mere inert artifacts until other creatures lend their power to crew them and bring them to life. There are creatures who come into play creating (either adding to their own strength, or creating little artifact creatures to help them out. And there is a new kind of energy, not mana, but special counters that can be spent at any time to help power up lots of tricks and abilities.